Well I have almost got everything done for the big game in Montreal this Sunday. It really has been a pretty busy time while at the same time I have worked almost every day. Essentially do a shift, come home eat something and start painting. I had hoped to have a few more new style casualty stands done, but I find the little dice holders time consuming to make, I will have to come up with a different plan if I hope to have one for every infantry battalion and cavalry regiment. I had also hoped to have some Prussian Landwehr mounted regimental officers done, but the ones from Warlord Games only arrived yesterday. Not all this stuff is new, but I have painted all these casualty figures and 4 of these sub commanders over the last week or 2. Also finished off 24 figures for RIR9 to complete that regiment and I just finished basing 24 figures for 2/1st Landwehr Regiment of the Elbe last night. I will post some photos of them next week. 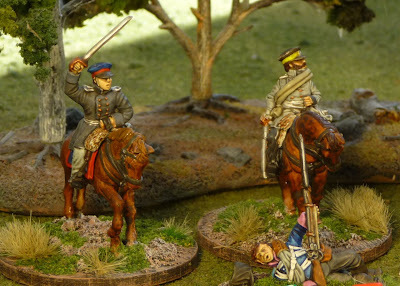 Here is my first cavalry casualty figure. Curt from Analogue Hobbies, kindly gave me 3 of these Cuirassiers a while ago, finally got around to painting one of them, a little rushed maybe but a very nice figure. 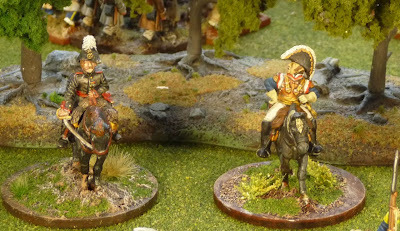 Here is a Prussian and French cavalry sub commanders on their new round stands. The French officer will represent a brigadier general, he was just painted. I really like the round stands and I hope they stick out on the table. 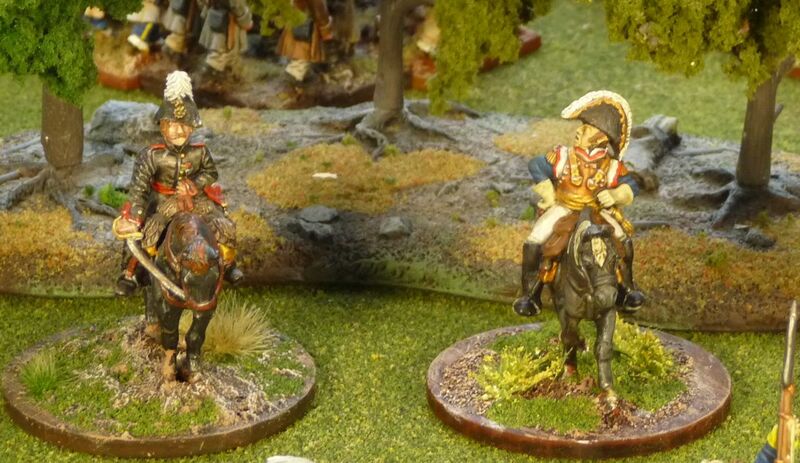 A couple of newly painted Prussian line infantry sub commanders. They will represent regimental colonels in the Prussian order of battle, I suppose the equivalent of brigade general in other armies. Some more Prussian casualty markers. I have taken Curt's advice and used 3 slots. In my upcoming game, I will use each slot to represent the damage taken to Stamina (BP rules) for each of the 3 battalions in the regiment. I hope eventually to have one for each battalion, so each of the dice can be used to represent different attributes for each battalion. But let's see how this goes first. I am hoping to post some photos of my Montreal bound Prussian brigade tomorrow, but we will see how it goes. I also have a bit of a surprise coming up: A new type of game, a new era and a trip back to my cultural roots. Any guesses? Some great looking bases, you just gotta love the poor sod falling from his horse!!! Very well done Sir!!! Very, very nice bases!! Bravo!! That is some production line with the amount of figures you have just painted. They all look superb. Beautiful work John! 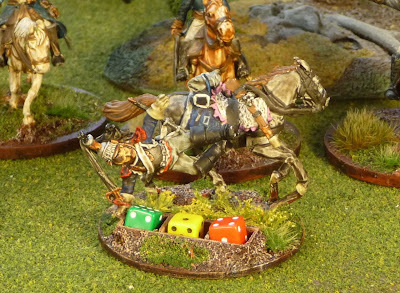 Glad to see that cuirassier pack being put to good use (unfortunate blighter...).